Is it legal to own a pet pig in Conway? A Vilonia family looking to relocate to another city, wants to know if their family pet can come along too. VILONIA, Ark. — You ask, THV11 listens. We talked to a Vilonia family is looking to relocate to another city. But before they do, they wanted to know if their family pet can come along too. You see, this is no ordinary house pet. So 11 listened and got answers about the rules and regulations that often vary from city to city. "We love her she's a part of our family," Vanessa Barnett said. Meet Ginger, a 16-month-old Juliana mini pig. "She likes to go outside and run around and play," Barnett said. To the Barnett family, she's just like any other house pet. "It's just really like having a small dog," she said. Barnett said she wanted a pet that her two children could play and interact with. "Both of them are allergic to dogs, so a small pig just seemed like a logical choice after we researched," Barnett said. Barnett’s 10-year-old son Ian has formed the closest bond of them all. "Ian is autistic, and so he has some challenges socially making friends, some emotional challenges," Barnett said. "They are friends -- they're close." It's why she's determined to keep Ginger once they relocate. 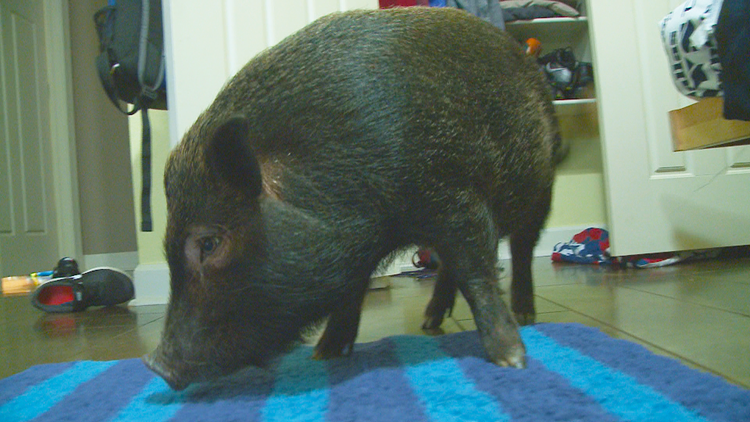 The family wants to make Conway their new home, but there's an ordinance that states pigs aren't allowed. Barnett wants to know if there's an exception to the rule. Will the city cooperate with a family that has a pig as a pet and takes care of that pet as such? "Unfortunately, swine and hogs of any kind whether they're pets or livestock are prohibited in the city limits of Conway, Ark," Bobby Kelly with the City of Conway said. Kelly said pigs are only allowed for a period of eight days whenever they're being sold or on display at the Faulkner County Fair. He said they don't have the infrastructure to house or feed pigs if an owner is no longer able to care for them, among other concerns. "Whenever they get out, whether they're a large pig or a mini pig, they can get out and they can be very destructive when it comes to private property,” Kelly said. If anyone is caught with a pet pig in Conway they'll be found guilty of a misdemeanor and fined anywhere from $50 to $1000. As for the Barnett family, they said they're looking into other cities that will allow pet pigs.